When it comes down to choosing what to smother all over the largest organ of your body, you want to choose wisely. 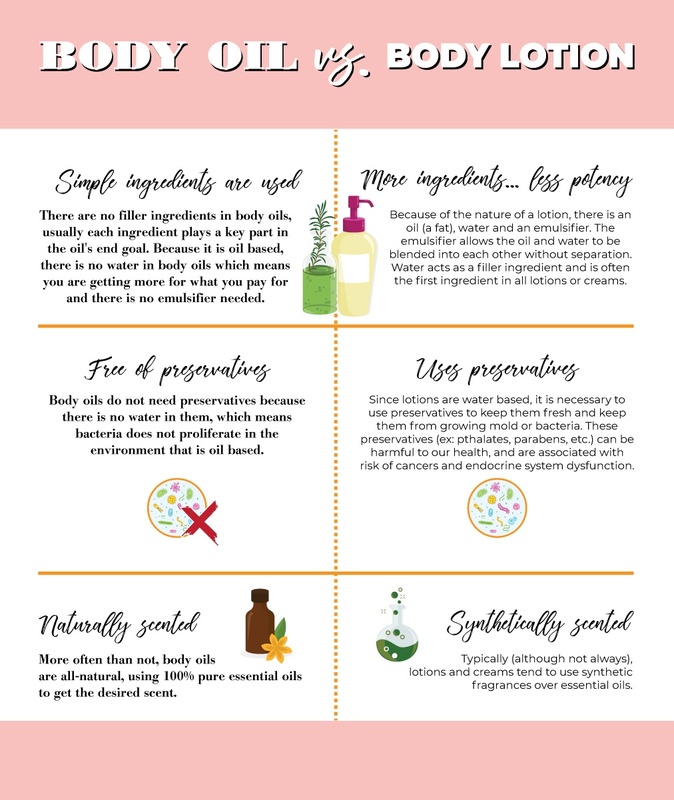 Here is the lowdown on both body oils and body lotions and which one is right for you. In the end, it's really about preference, so long as you choose a body lotion that doesn't have any "mystery" ingredients. Both will be moisturizing to the skin, and again, depending on the ingredients, both have the potential to be very nourishing to the skin. Whether you have dry, scaly skin or oily and greasy skin, play around with both! One may work better for your skin, so get familiar with what works so you can provide your skin with what it's craving. Are you thinking about making the change from lotion to oil? 2) Pump a nickel-sized puddle of oil in the palm, rubbing palms together and then rubbing into the skin - usually that amount will cover about 1-2 limbs. 3) Continue pumping and rubbing until all desired areas are moisturized. This application method will leave your skin smooth and hydrated, without feeling oily, all day long. I encourage you to take your time when massaging the oil into your skin - it should a relaxing, enjoyable experience. Watch this quick video to learn how to massage yourself with olive oil, and #treatyourself. Also, a last thought to consider... Oily skin occurs when our natural oils are stripped from our skin. This is typically caused by soaps, body washes, or lotions that contain harsh chemicals. Our bodies produce oil in excess to make up for the lack of oils present on the skin resulting in oily or greasy looking and feeling skin. If you have super oily skin, you may want to consider switching to a body oil. Which do you prefer - body oil or body lotion? Will you give body oil a try after reading this? May we recommend our Bath & Body Oil from Olivespa? It's fantastic!